Amatib 80% water-soluble powder as an active substance contains amoxicillin trihydrate – 80%, and as auxiliary substances – sodium carbonate monohydrate, sodium citrate and colloidal silicon anhydride. 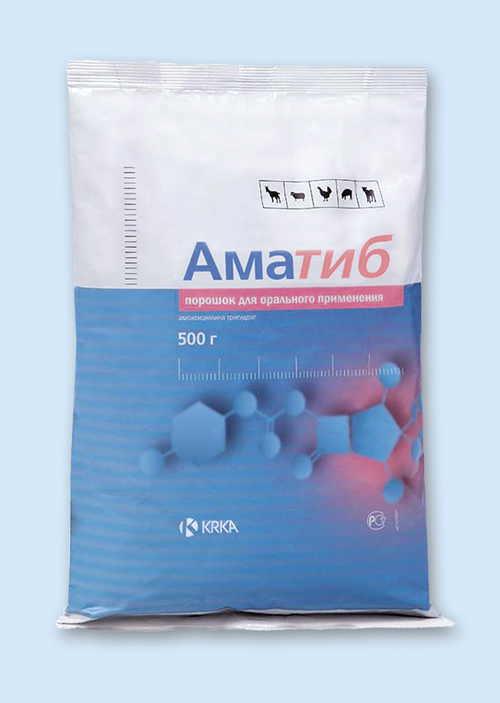 Amatib 80% water-soluble powder is prescribed for pigs, calves, lambs…, for therapeutic purposes, for agricultural poultry – with a curative and therapeutic-prophylactic purpose for acute and chronic diseases of the respiratory system, genitourinary system, gastrointestinal tract and other primary and secondary infections of bacterial etiology , Whose pathogens are sensitive to amoxicillin. – Pigs and farm birds with water for drinking at a dose of 250 g per 1000 liters of water (10-20 mg of amoxicillin per 1 kg of body weight). The therapeutic solution is prepared daily during the treatment. In the case of a group method of application, pigs and poultry should receive only water containing the medicinal product. 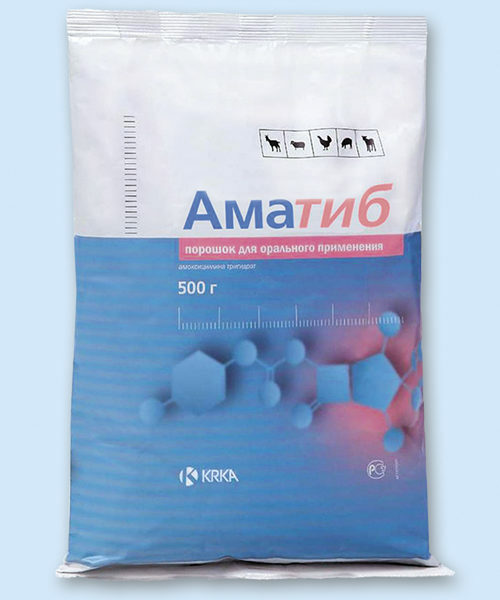 Amatib 80% water-soluble powder is not allowed to be used for laying hens whose eggs will be used for food purposes and for repairing young hens less than 2 weeks prior to the beginning of laying, due to the accumulation of the drug in eggs, adult ruminants with developed cicatricial digestion, and Animals with severe renal and hepatic insufficiency. Slaughter of pigs, calves, lambs and kids on meat is allowed not earlier than 8 days, birds – not earlier than 3 days after the last use of the medicinal product. Meat of animals, who were forced to die before the expiration of the specified time, can be used for feeding fur-bearing animals. Amatib 80% water-soluble powder packaged in hermetically sealed bags of laminated foil for 100, 250 and 500 g. Each unit of packaging is supplied with instructions for use.